You say hangover, I say broccoli cheddar soup bread bowl. In college, (pre-Celiac diagnosis), my go-to for nursing a rough but probably well-deserved hangover was a Panera bread bowl filled to the carby brim with broccoli cheddar soup. That's right. A bowl of gluten, filled with gluten. I am so, so sorry, body. I just had no idea. 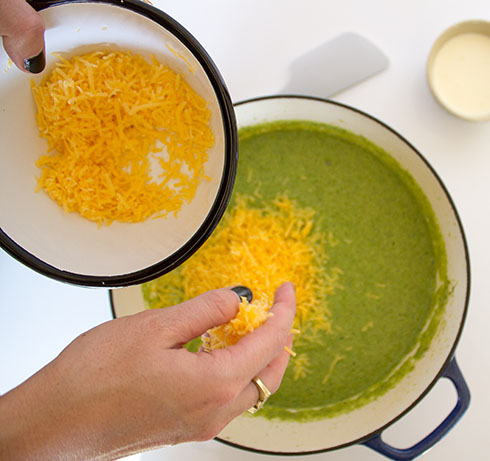 These days, I still LOVE me some broccoli cheddar soup, with or without the prerequisite hangover. I'd like to think this recipe is a tad healthier than Panera's version, since it only has a cup of cheese and a quarter cup of heavy cream (which really you could leave out if you wanted to). 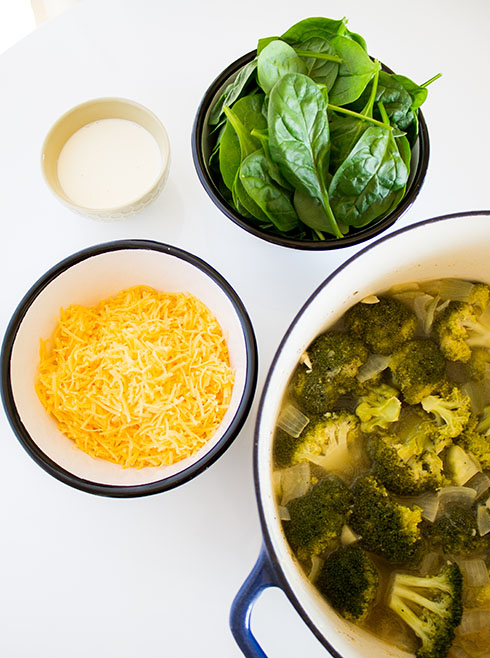 The soup gets a lot of body and richness from cooking and blending the broccoli stalks, which I'm happy to use instead of tossing them! 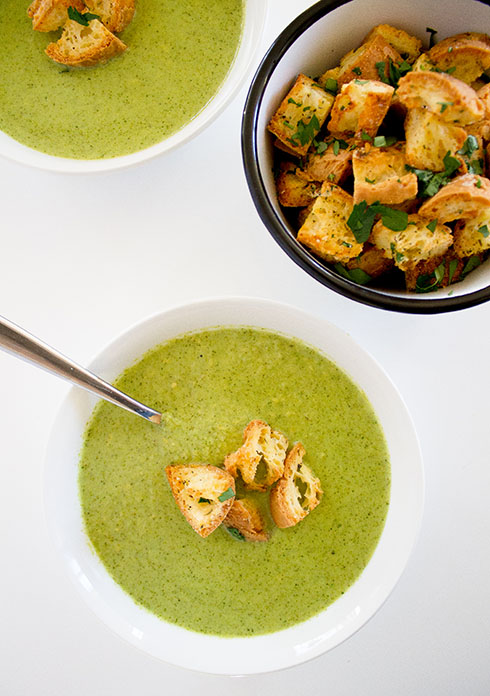 In place of the bread bowl of days past, I top each bowl of soup with a handful of crispy, garlic-herb croutons made from Against the Grain Gourmet baguettes. Have you guys had these baguettes? They're incredible. I can't even keep them around at my parents' house because my sister (non-Celiac) likes them better than regular bread. Go figure! This recipe ROCKS if you have an immersion blender. (I have this one.) You can totally transfer the soup to a blender in batches, but if you make a lot of pureed soups and sauces you should really think about making the switch. There's less cleanup, and honestly it's SO fun to whiz everything up right in the pot. Though beware of splashing. Or your dog will end up with a splash of bright green broccoli cheddar soup on his head.... that you don't find until 4 hours later. MMM LEFTOVERS. 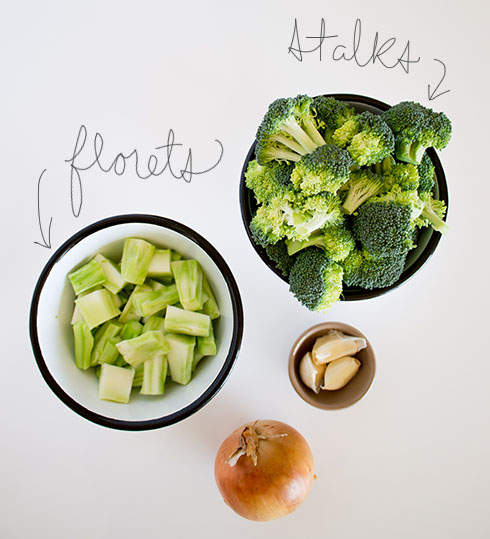 Remove the florets (tops) from the broccoli, and separate into individual florets. With a sharp paring knife or vegetable peeler, remove the outer layer of the remaining stalks. Roughly dice. In a large, heavy-bottomed pot (like this one), melt the butter over medium heat. Once melted, add the onion, broccoli stalks, dry mustard, salt and pepper. Saute for 5 minutes, stirring occasionally. Add the garlic, and cook for 2 more minutes. Remove the soup from the heat. Stir in the spinach. Using an immersion blender, blend until the soup is completely smooth. (If you're using a blender instead, CAREFULLY transfer the soup to the blender, filling only halfway, and blend until smooth. You'll probably need to do this in two batches, then return it to the pot.) 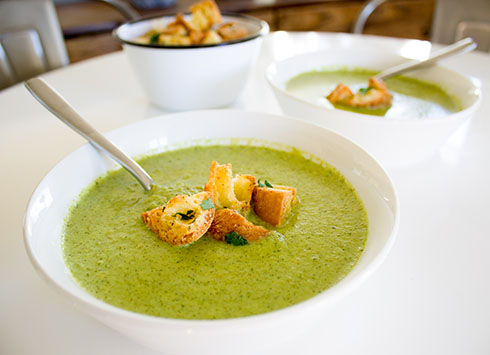 If your soup is a bit too thick, add more stock to achieve the desired consistency. Stir in the shredded cheese and heavy cream. 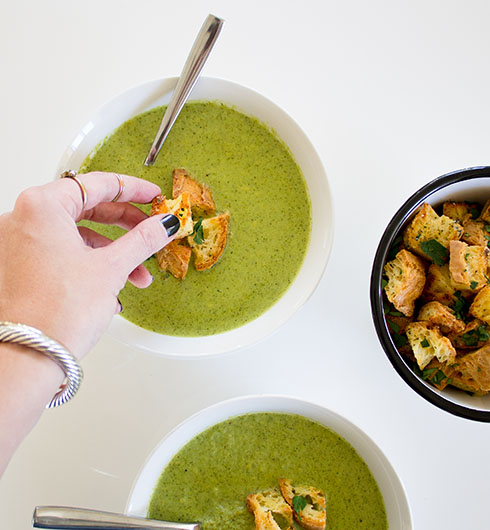 Serve warm, garnished with gluten free croutons (recipe below). Add the bread cubes to a large bowl. Drizzle the olive oil around the inside of the bowl, and toss to coat. Sprinkle the garlic powder, Italian seasoning, salt and pepper over the bread, and toss once more. Spread the seasoned bread cubes in an even layer on a foil-lined baking sheet. Bake for 15 to 20 minutes until golden and toasted, tossing halfway through. 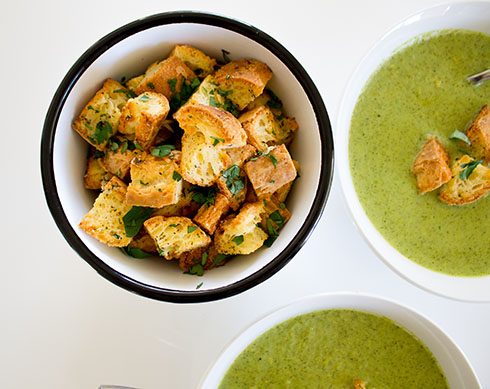 Remove croutons from the oven, and immediately sprinkle with Parmesan cheese and fresh herbs. Toss to coat. 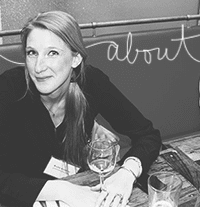 Can be served immediately, or made ahead of time and stored in an air-tight container.